Another blustery day, another Malabrigo winter accessory. Just like the neck warmers, this hat was a no-brainer. Brioche stitch in the round using the luscious worsted weight merino Malabrigo. The color is burgundy (#41), and I used a bit more than half a skein to make the hat. I think that 2 skeins will be perfect for making a hat and neck warmer combo, with enough extra yarn to add a brim or a few more inches to the neck warmer. A gift that’s wonderful, seriously quick, and not too harsh on the wallet (I’m just saying). In some ways, I followed the pattern in Weekend Knitting with more precision – the decreases at the crown were a snap once I read how they were constructed in the book. But I also altered some of the other elements – I worked over 56 stitches (rather than 64), omitted the folded brim (that’s the first 3″ of the pattern), and used only one color. And now I have a hat that’s perfect for me… if I dare go outside! DON’T DO IT! It’s scary out there, and the freezing rain is nothing to mess with. The hat looks great… and going outside was what YESTERDAY was for! Today is a hot toddy, knitting, holiday card writing, laundry kind of day for sure. Oh wow, that’s lovely and the colour really suits you. Lovely hat! Gorgeous color. I have a skein of Malabrigo in Verdes that I bought last year. A new hat seems just the thing to make this afternoon…especially since we’re already done shoveling the car out of that horrid snow/sleet/rain, and I’m not interested in working on the intarsia stocking I’ve got in front of me. 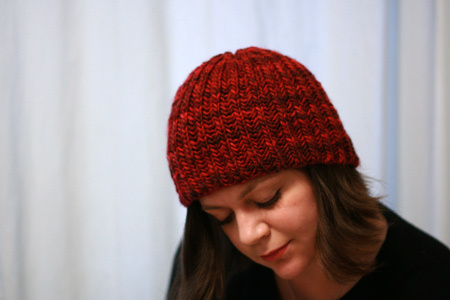 Both you and the new Malabrigo hat look too fab for words! Love the perfect lip color, too. I must say, you look great in that hat. Sometimes a knitted hat can look, well, a bit homegrown. Yours looks warm, stylish, perfect! The color is perfect for you–you are so pretty. Must the all the anticipation for the upcoming happy event! That yarn colour is gorgeous! Also, I am envious of your hat-wearing skills–I wear, but look ridiculous. It looks great! You know, I need a new hat. I think it is Malabrigo weather here too… I started a hat for my daughter in it earlier. Such an amazing yarn, I may have to get over my hatred of hats and make one for myself as well. The variegation of the yarn is beautiful. The hat looks so warm and cozy without being too bulky. And yeah, I decided to postpone the errands I had scheduled for today until it clears up a little. Today is a perfect stay-in-and-knit day. It’s a beautiful hat! I recently found your blog through Yarn Over Manhattan/Violiknit’s blog. I’m a beginner knitter and love reading your blog. You look so beautiful in these pictures. Oh, and the hat’s nice too. 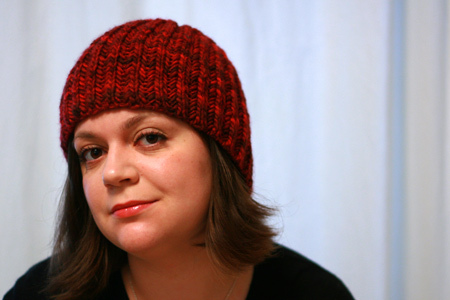 The hat is too perfect – lovely color, great mods, cute on you and gorgeous photos!!! Love that neck warmer too. And thanks for the inspirations! Between your beautiful hat & neckwarmer AND just finding Sleepy Eye’s Amanda Hat I’m ready to dip my hand into the Malabrigo well. Thanks for the inspiration. Today is a good test for that cozy hat- It is FREEZING out there and wind, windy, windy. I used about half a skein of Indigo MMmmmMmmmalabrigo to make a pair of mitts yesterday for a gift. I have a skein of russety red to make a second pair of gift mitts and then I’m thinking I will use the left overs to make something…for me! Hmm. I’ve been looking for a pattern that’d be quick (only a week to go before Christmas knitting deadline doom) but suitable for a hat for my boyfriends grandad, and this looks like just the thing. Now, to figure out brioche stitch in the round. I have to tease – you’re wearing make-up and everything! 😀 Looks wonderful, of course. Don’t get stuck in the snow! cute hat and great color on you! That’s a seriously gorgeous hat! I’m moving to the midwest next month (from California) and I’ve been looking for a great hat. Thanks! Looks great! I love the colours. Should be perfect even if you decide to stay inside! Today’s safe to go outside. Just watch out for the ice… I have a hand-size bruise on a rather tender (though thankfully, well-padded) part of my anatomy. I have a skein of the same colour of Malabrigo, and soon, soon! I will be able to knit with it, not just stroke it. Hurray! WOW I just got that book out of the library and that was my fav pattern, with the neckwarmer. The color is just stunning on you. Stay in and make more hats. Our current weather is not fit for anyone but the Snow Miser. Oooh, that color is SO great on you! Nice work capturing the dark red variegation in the Malabrigo! I knit a Shifting Sands scarf out of the Pagoda colorway earlier this year, and I discovered that deep red is notoriously difficult to photograph accurately. Kudos to you on another lovely FO! I so want your hat! I don’t look good in hats though so I guess you should keep it – it looks great on you! Hey, lovely lady! Such a beautiful color on you. I just made a couple of gift hats out of the scrumptious Malabrigo worsted, soooo yummy. The brioche stitch shows off the color variegation so well. Wow, what a fabulous hat! You constantly remind us that it is possible to look beautiful in winter clothes (I end up looking like Nanook of the North, except I have pretty knitted socks on). You do need to go outside, even if it’s just to Dunkin Donuts. Just take a walk and strut that hat. Did you use two strands like the pattern in Weekend Knitting? What a great picture of you! The hat is really nice, too. It is beautiful~ that shade of red is a perfect color for you. I recently thought about making that hat after my kitty decided to maul my Odessa, but decided it was going to take too much time. Instead I picked a different pattern and have been wearing my emergency backup hat until I have time to finish. I love how it looks, all warm and thick. hat is gorgeous. I know your projekt to ravelry. Excuse me, but my english is so bad.